Italian Air Force Brigadier General Alessandro Pera, head of the NATO Active Layered Theatre Ballistic Missile Defence (ALTBMD) Programme Office, delivered the plan to NATO Deputy Secretary General Claudio Bisogniero while the second day of a NATO Military Committee meeting at the Atlantic Alliance headquarters in Brussels with chiefs of defense staff and other military representatives from 66 countries was underway. This year the Pentagon will begin its announced ten-year Phased Adaptive Approach (sometimes with a comma between the first two words) project to deploy medium- and intermediate-range interceptor missiles on ships in the Baltic Sea and Mediterranean Sea, which will be followed by the stationing of no fewer than 48 advanced Standard Missile-3 (SM-3) interceptors in Eastern Europe: 24 each in Romania and Poland. The SM-3 is a ship-based missile jointly developed by the U.S. and Japan which will be deployed on Aegis class guided missile destroyers and cruisers in the two above-mentioned seas. A land-based version of the missile (Aegis Ashore) will be deployed near the Baltic and Black Seas in Poland and Romania. Missile radar sites will accompany the interceptors, with potential sites discussed to date including Bulgaria, Turkey, the Czech Republic, Azerbaijan and Georgia in addition to the X-band radar (AN/TPY-2 Transportable Radar Surveillance/Forward Based X-band Transportable) designed for the Terminal High Altitude Area Defense (THAAD) anti-ballistic missile system, with a range of 2,900 miles, deployed to the Negev Desert in Israel in 2008, manned by over 100 U.S. military personnel including a representative of the Missile Defense Agency. The Azerbaijani location would be the early warning radar facility at Gabala currently operated by the Russian Space Forces. This week four U.S. senators endorsed the placement of an interceptor missile radar facility in Georgia, which fought a five-day war with Russia in August 2008. Last May the U.S. deployed the first interceptors in Europe, a Patriot Advanced Capability-3 battery in the Polish city of Morag, 35-40 miles from the Russian Kaliningrad district. An estimated 150 American troops arrived with the missiles to service and train Polish service members to operate them. 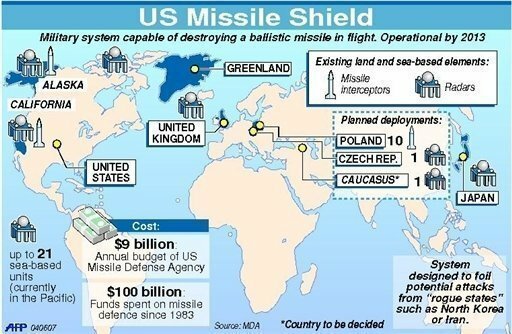 Until 2005 the U.S. had concentrated its missile shield initiatives further east: In Alaska, including its Aleutian Islands chain, and Japan, with preliminary radar facilities in Greenland, Britain and Norway to the west. The Missile Defense Agency’s 280-foot-high Sea-Based X-Band Radar, which displaces 50,000 tons and has a surface as large as two football fields, is based in Adak in the Aleutian Islands near Russia’s Kamchatka Peninsula. Developments took a dramatic turn in that year, however. On March 11 NATO’s North Atlantic Council, its highest civilian governing body, approved plans for a theater missile defense (TMD) system to protect deployed troops. The military bloc at that time had forces on the ground in Bosnia, Kosovo, Macedonia, Afghanistan, Kyrgyzstan, Tajikistan and Uzbekistan. The integrated system was to achieve initial operating capability last year – when NATO’s 28 members unanimously authorized a far wider-ranging missile shield at the Alliance’s summit in Portugal in November – and full operating capability in 2013. At almost exactly the same time, in November of 2005, Agence France-Presse disclosed that the U.S. was developing a complementary and more advanced interceptor missile program for Europe. Eastern Europe. The U.S. official quoted above would not divulge which other countries would be involved in the system as planned at the time, but confirmed that the deployment in Poland would be comparable to those at Fort Greely, Alaska where the Missile Defense Agency is working on completing the construction of as many as 14 silos with 30-40 long-range ground-based interceptors as part of the Ground-based Midcourse Defense element of America’s global missile shield plans. That was the strategy pursued by the George W. Bush administration but superseded by its successor in 2009. In adopting a continent-wide interceptor missile program as part of its new Strategic Concept last November, NATO agreed to subordinate its 26 members and 14 partners (17 if the South Caucasus is included) in Europe to a U.S.-dominated missile system that is not limited to the continent but is an integral part of a global layered and integrated missile shield network. “The State Duma believes that maintaining Russia’s nuclear deterrent in an adequate state of readiness is a key venue of the country’s military doctrine, with the focus on the deployment of strategic offensive weapons that possess the most combat effectiveness and the highest potential to penetrate missile defenses. “So this is not a joking matter. We expect from our NATO partners a direct and unambiguous answer. “In either case, we are either together with NATO, or we separately find an adequate response to the existing problem. “Neither NATO nor the US has answered Russia’s questions so far. The would-be shield is even called differently by both sides. While the Russian leadership describes it as ‘European missile defense system,’ it is referred to as ‘NATO’s missile defense system’ in the alliance’s official documents. “The development of new warheads looks like Russia’s answer to plans of the US and NATO to create a new missile defense shield for Europe. Both Washington and the alliance had formally invited Moscow to take part in a joint program. But even Europeans themselves do not know the exact details of the initiative. On the day the above appeared NATO announced the activation of its first anti-ballistic missile capability. So much for pushing reset buttons with the new START agreement and the reactivation of the NATO-Russia Council in November. “For the interim capability, five nations are contributing weapons systems and sensors: Germany, Patriot PAC­3 missiles; France, SAMP/T missiles; Italy, Horizon-class frigates; the Netherlands, Patriot PAC-3 missiles, ADCF (Air Defense Command) frigates; and the United States, Aegis cruisers, Patriot PAC-2 and -3 missiles, space early warning. The missiles mentioned can act both as missile interceptors and as anti-aircraft missiles. “The interfaces between ALTBMD and the U.S.A.’s Phased Adaptive Approach have already been successfully tested. Washington persists in the disingenuous contention that covering Europe in a U.S.-controlled missile shield is aimed at protecting nations from Poland to Britain from North Korean, Iranian, Syrian and even North African threats. 2018 is the year the U.S. will inaugurate its Phase 3 advanced SM-3 interceptor site in Poland. “The United States remains our strategic partner and our main ally in the field of security. Today, the main vector of our cooperation is the anti-missile shield. We wish to conclude this year the bilateral negotiations.”  In 2005 the Pentagon secured the use of four military bases in Romania, including what is being upgraded into a strategic air base. Two days before the above quote appeared on the Internet, it was reported that the U.S. Air Force had “augmented the hardware of a missile defense radar facility in Greenland,” NATO ally Denmark’s possession, and that it “has already upgraded early warning radar sites at Beale Air Force Base in California and at Fylingdales Royal Air Force Station in the United Kingdom,” and “intends to update two more of the sites.”  An island between the Arctic and Atlantic Oceans is an odd location for tracking imaginary Iranian and North Korean intercontinental ballistic missiles. The Navy announced in a press release that it was “the first live ballistic missile defense test on the East Coast,” as before then Standard Missile-3 intercepts of target missiles (and in February of 2008 a space satellite) had been conducted from the Pacific Missile Range Test Facility in Kauai, Hawaii. Medium Extended Air Defense System (MEADS) International, based in Orlando, Florida, recently disclosed that it had successfully conducted “milestone tests” on an X-band radar system and was preparing for systems testing this year at the Pratica di Mare Air Force Base in Italy. The U.S. funds 58 percent of the MEADS European missile defense program, with Germany and Italy providing 25 and 17 of the financing respectively. A copy of Ronald Reagan’s Star Wars speech of March 23, 1983 is displayed prominently at the Missile Defense Agency’s Von Braun Complex in Huntsville, Alabama. U.S. officials, military and civilian, have openly spoken of having brought to fruition Reagan’s plan for a Strategic Defense Initiative in intent and practical effects if not precise configurations. The Aegis Combat System is a product of the Strategic Defense Initiative. Last year President Obama pushed for an increase in the system’s Standard Missile-3 interceptors to 436, up from the previous year’s request of 147 of the missiles costing $10-15 million apiece. NATO’s summit in Lisbon last November has delivered almost the entire European continent to a 21st century version of Star Wars.